Last year I hosted the first L.M. Montgomery Reading Challenge during the month of January and I can hardly believe that it's time to announce Round 2. I'll be hosting it again this coming January and the rules will be the same as last year (which means, essentially, that there are no rules). I like keeping it simple because everyone's schedules are so varied and some people might be interested in just picking up one book by Montgomery and others are interested in reading through a series. Last year, several of you made friends with Anne Shirley (my favorite female character of all times). Others of you read the Emily books and some of Montgomery's short stories. For my part, I spent the better part of the Challenge last year learning about Montgomery herself. This year I'm looking forward to reacquainting myself with Montgomery's characters. 1. Pick the Montgomery book (or books!) that you most want to read and then read them during the first few weeks of January. I'll have a Mr. Linky up on January 1st through January 8th for you to link up to if you plan on participating in this challenge. All you need to have prepared on January 1st (or shortly thereafter) is a blog post pointing people back to the Mr. Linky post and challenge. In other words, create a blog post saying, "I'm in!" and link it up here. If you'd like to say which books of Montgomery's you plan on reading during the challenge, do so then! There are a great many to choose from. 2. Come back on Sunday, January 31, 2009 and link up however many Montgomery related reviews/posts you like. If you are new to Montgomery, and have never read anything by her before, I strongly recommend you spend time with her most well-known character, Anne of Green Gables . 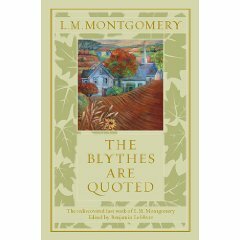 If you've been around Montgomery awhile, you might want to pick up a copy of The Blythes are Quoted which includes never-before-published stories by Montgomery. This book has just been released in the U.S. and it's on its way to my house via Amazon.com express (of course)! I'm looking forward to reading this book in particular. 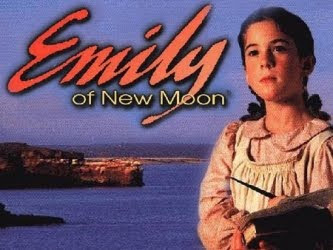 - The Emily of New Moon series (3 book series and 2nd in popularity after Anne) *I recently began watching the Emily of New Moon television series and reviewed it over at 5 Minutes for Books if you'd like to hop over and see my review. - For a very short, sentimental & romantic read, I'd recommend Kilmeny of the Orchard which may take 1 1/2 hours of your reading time but will leave you feeling very happy. However, pick anything you like! My goal is only to make you more familiar with Montgomery or to give you an excuse to visit with old friends. Spread the word, pick your books and get ready for January when we'll ease into the new year on a warm note! I am hoping to get Anne of Green Gables for Christmas, if not I will head to the library. I am looking forward to reading it for the first time!! The series of Anne of Green Gable books is my all-time favourite. I always felt a connection to Anne (being a redhead, maybe...)or it could be her spunkiness. I'd like to re-read some of the books...maybe find some I haven't read yet. Anne!! At this very moment I have the Anne DVD wrapped under my tree just waiting for me to open next week. :) I'll have to pick up a copy of the book from the library in January. Can you order a copy of Blythes are Quoted through Amazon.ca? Or one of the Canadian booksellers like Chapters Indigo? I just read it and it is fantastic. Hope you can get a copy! You can also try ebay. I looked on bookfinder.com hoping to find a good link for you -- I'm Canadian and got my copy in October. However, having read it I would suggest that this book be reserved for fans that are well acquainted with her other work. I personally recommend A Tangled Web or The Blue Castle to new Montgomery fans every time. Is this only for people with blogs? I dont see will enough to do one. Wow...the Emma jewelery is beautiful. Realistically, I like the sterling ring 38112, but really, I like the ruby 480...much more than my engagement ring! I didn't even look at necklaces yet! I just finished reading Marigold's Magic! I loved it. Highly recommend it!